In order to cover all of a Fintech’s diverse needs, the programming language used needs to be easy to handle, scalable, mature, have high-performance, and be equipped with in-depth ready-made libraries and components. If there’s one language that ticks all of these boxes, then it has to be Python. 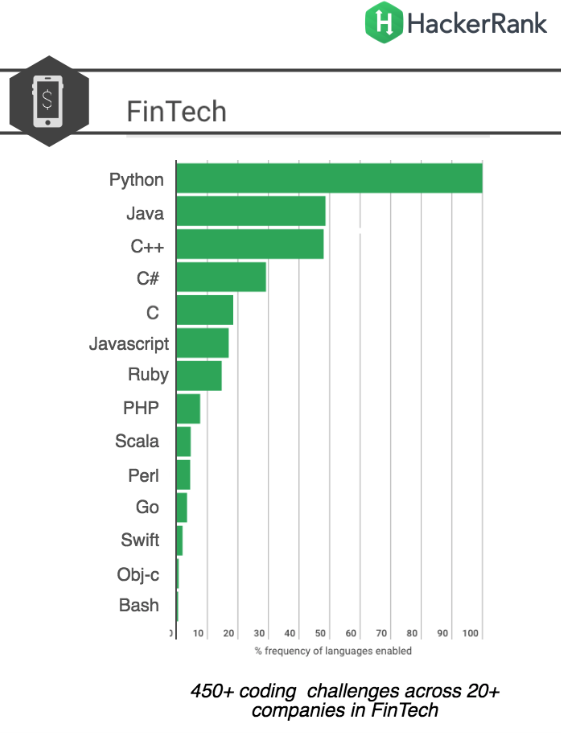 Indeed, according to HackerRank, Python tops the list of the most-used technologies for Fintech. Why is Python such a good choice for Fintech? Well, Fintech products are naturally concerned with many figures, calculations, and data, and so the applications are required to be efficient at mathematical tasks. What’s more, it happens that Python’s syntax is very close to the mathematical syntax used in financial algorithms, which also makes it the language that is most easily learned by other professionals working in finance, such as mathematicians and economists. In addition, Python is a comparatively simple and clear programming language when held up against other options, and it’s also great for machine learning, data science, and is famous for its continuous improvement. Put it all together and it’s no wonder that so many Fintech companies operating today include Python in their tech stack, and in this article, we’re going to be looking at nine of them. Let’s dive in. Founded in 2010 with headquarters in San Francisco, California, Stripe provides APIs that web developers can use to integrate payment processing into their websites and mobile applications. Designed to simplify online financial transactions for ecommerce merchants and other businesses that receive payments over the web, Stripe has since expanded its services to allow businesses to manage subscription-based recurring revenue, invoicing, and has recently released anti-fraud tools to block fraudulent transactions. Estimated to be worth around $9 billion, thousands of businesses use Stripe all over the world – including Salesforce, Lyft, and Amazon – and Python plays a key role in the Stripe tech stack. Zopa was the UK’s first peer-to-peer (P2P) lending website, founded in 2004. Cutting out banks and other middlemen, Zopa allows lenders and borrowers to instead deal directly with each other. Individual consumers can take low rate personal loans from Zopa of amounts between £1,000 and £25,000, and lenders receive either 4.5% or 5.2% returns (minus a 1% fee) on their investments. When people lend money through Zopa, the amount is split up into £10 chunks which are then spread across many different loans – meaning lenders are never putting all of their eggs in one basket. 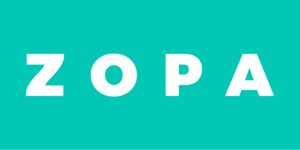 Since its launch, Zopa has lent more £3.64 billion to UK consumers. Over 60,000 individual investors now use the platform, lending money to more than 311,000 borrowers. Looking at current job postings, Zopa is currently on the lookout for software engineers and data scientists with “excellent programming skills in Python”. Why? Because “We are strongly committed to Python as a key language in our technology stack and have big plans for the future,” the company says. An alternative to credit cards and personal loans, Affirm lets consumers finance large purchases in instalments over time from select merchants at the point of sale. Headquartered in San Francisco, California, Affirm performs a soft check on consumers’ credit scores to determine their risk as a borrower, and, if they pass, what their interest rate will be. There are no hidden fees – customers know exactly how much they will have to pay back the moment they complete their purchase. Customers can sign up for an Affirm account on the company’s website, or simply select Affirm as a payment option at any participating store. According to current job listings for Software Engineers at Affirm, the company states that it “primarily uses Python”, in which applicants must have “strong ability”. Robinhood is a California-based startup with an app that lets regular people buy and sell stocks typically only afforded to the rich (hence the name) without trading fees. 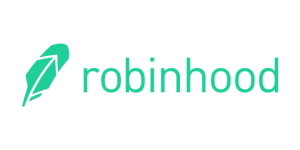 Popular among millennials, Robinhood helps users to learn to invest in the stock market as they build out their portfolios. In short, it makes stock trading cheap, intuitive, mobile, and accessible. First launched in 2014, the company now has a $5.6 billion valuation. Robinhood lists Python in its tech stack on Siftery, and job listings for Backend Engineers require “intimate familiarity” with the language. Instant Working Capital – better-known as iwoca– provides startups with loans between £1,000 and £200,000 for cash flow, stock, or investments. The company’s technology allows it to make quick and fair loan decisions, based not just on credit scores, but business performance as well. iwoca has lent more than £500 million to thousands of businesses in the UK and Europe since its inception in 2012. The company is currently looking to expand its team to help it reach its goal of financing a million small businesses within a decade – and it’s looking for Python Engineers (“We use Python”) to enable it to do so. Bought By Many is a service that uses internet crowdsourcing to lower insurance premiums for consumers. The start-up enables people with common needs to band together on a simple, user-friendly platform, and it then negotiates group discounts with established insurers on their behalf. Covering everything from pet insurance to home insurance and travel insurance, Bought By Many secures better deals from insurance providers than what each of its members would be able to barter individually. The company is currently listing jobs for full-stack developers, with Python at the top of list of skill requirements. Based in Finland, Holvi provides a traditional banking platform plus additional services for SMEs (small to medium enterprises), including an online sales platform, cashflow tracking, and invoicing. Oscar Health is a millennial-focussed health insurance startup based in New York. The company uses data to offer users a customer-centric service through a smartly-designed app that allows patients to track doctor visits, prescription drug purchases, lab work, and access affordable healthcare insurance. According to Periscope Data, the Oscar Health team has built a tool in Python to standardise an A/B testing framework to improve the company’s ability to track huge volumes of data related to members’ health care, business integrations, claims data, and product interactions. Job listings for Software Engineers also require applicants to have skills in Python. Revolut is a UK-based digital challenger bank, founded in July 2015. It offers free international money transfers and fee-free global spending at the interbank charge rate. Customers can open an account in just 60 seconds, and come with a multi-currency card with an app attached. With Revolut, customers can exchange 25 currencies within the app, send free domestic and international money transfers, and spend abroad with no fees in over 130 currencies with a contactless MasterCard or Visa. This list is by no means exhaustive, but it gives you a clear idea of the many and varied Fintechs out there that rely on Python to build enterprise software, grow, and innovate. If you know of any other great Fintechs out there that use Python and deserve a mention, let us know in the comments below. And if you’re in Fintech and are looking for a talented team of Python developers, get in touch with us here at Netguru – we create revolutionary Fintech products that let people do things differently.